Vietnam National Petroleum Group (Petrolimex), Japan International Cooperation Agency (JICA) and Tamada Industries. Inc. of Japan just held a meeting to recapitulate the project “ Study and Experiment double-hulled oil tanks with reinforced coat by Japanese technology against leakages of detrimental substances” in November 11, 2014 in Hanoi and Nov. 13, 2014 in Ho Chi Minh City. Attending the meeting were Mr. Masuda, Deputy Chief of JICA Hanoi, Mr. Toshifumi Sakai, Chief of JICA Ho Chi Minh City, Mr. Yoshiaki Tamada, Director of Tamada Vietnam, Colonel Doan Huu Thang, Vice Director General of Fire, Rescue and Salvage Department of The Ministry of Public Security, Mr. Cao Anh Dung, Vice Director General of the Department for Safety Technology and Industrial Environment of the Ministry of Industry and Trade, Mr. Tran Van Thinh, Director General of Petrolimex, Mr. Vuong Tien Dung, Vice Director General of Petrolimex, representatives of related authorities, Petrolimex companies and a number of oil trading enterprises. This is a project within the framework of ODA grant by Japanese Government in implementing the program “Experimental propagation of technologies by Japanese medium and small scale enterprises (SME) aiming at proving the efficiency of application of Japanese SME technology in developing countries and intensifying development benefits through the spreading of technology and products”. In July 2013 The Japanese Government selected Tamada Company as the hub for developing the project with Petrolimex. Petrolimex appointed The Construction and Installation Joint Stock Company No. 1 (PCC1) to directly coordinate with Tamada in the experimental production and installation, and evaluation of pilot doubled hulled tanks. After more than one year, with close coordination between Tamada, Petrolimex Vietnam together with PCC1 and under the surveillance of JICA, the project was crowned with success; contents and basic aims of the project achieved in time and good quality. Speaking at the ceremony, Deputy Chief of Staff of JICA Hanoi Mr. Masuda highly valued the efforts by the parties, the utmost help by related authorities, especially the Ministry of Industry and Trade, The Ministry of Public Security and the Ministry of Natural Resources and Environment. 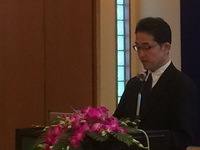 He stressed that to aim at a safe and sound society, together with the expansion of advanced technology by Japanese businessmen and the promotion of trading relations between the two countries, the support for durable social and economic development of Vietnam is highly significant for both Japan and Vietnam. The success of the Technology Transfer Project is the prerequisite for the completion of legal framework and application of technology for the production and put into wide operation of double hulled tanks in Vietnam. Petrolimex exerts its utmost to study and look for solutions and application of modern technology to modernize its infrastructure, increase the working ability, intensifying the safety standard in the operation of its oil projects, to control well and reduce hazardous risks in fire and explosion and environment pollution.